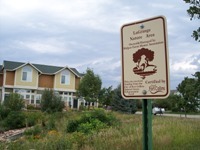 The City of Fort Collins Natural Areas Department funded enhancement projects to encourage stewardship of all natural areas. Financial assistance was available for projects designed to enhance or restore private or public natural areas in Fort Collins. Examples of projects included native tree and shrub plantings, removal of exotic pest trees, wetland restoration, or native grassland revegetation. The Natural Areas Department will not be accepting any Enhancement Fund applications for 2018/2019 grant cycle, as the program is being re-tooled. Stay tuned for some exciting new resources and ways to provide nature in your neighborhood. In the meantime, subscribe to the Natural Areas newsletter to be the first to know about the new program.